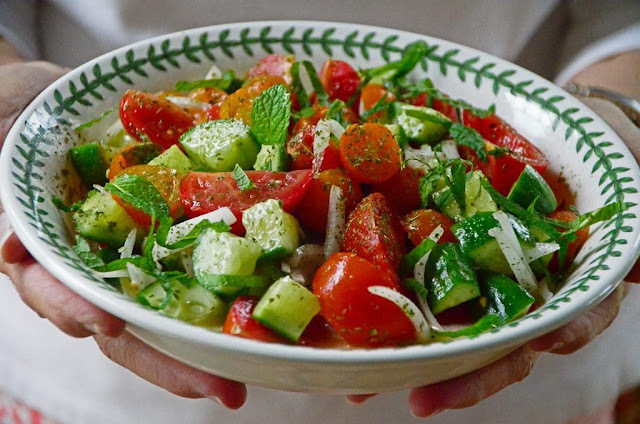 One of the best things about this salad is the juice that waits in the bottom of the bowl, ready to be sopped up with thin pita or flatbread. Make the salad an hour or so in advance to let the flavors meld. In a large salad bowl, combine the cucumbers, tomatoes and onion. Top with the garlic, fresh and dried mint, olive oil, lemon, salt and pepper, stirring well to coat the vegetables evenly. Taste and adjust seasoning. Eat the salad up and then make another, soon.